“Two men, both seriously ill, occupied the same hospital room. One man was allowed to sit up in his bed for an hour each afternoon to help drain the fluid from his lungs. His bed was next to the room’s only window. The other man had to spend all his time flat on his back. The men talked for hours on end. 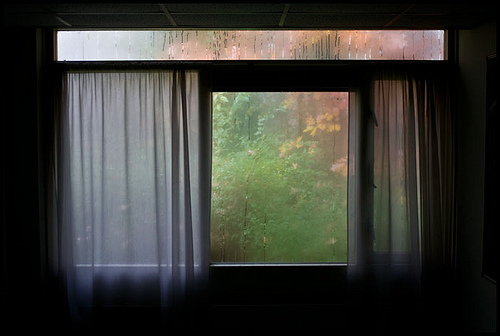 They spoke of their wives and families, their homes, their jobs, their involvement in the military service, where they had been on vacation.. Every afternoon, when the man in the bed by the window could sit up, he would pass the time by describing to his roommate all the things he could see outside the window. The man in the other bed began to live for those one hour periods where his world would be broadened and enlivened by all the activity and color of the world outside. The window overlooked a park with a lovely lake. Ducks and swans played on the water while children sailed their model boats. Young lovers walked arm in arm amidst flowers of every color and a fine view of the city skyline could be seen in the distance. As the man by the window described all this in exquisite details, the man on the other side of the room would close his eyes and imagine this picturesque scene. One warm afternoon, the man by the window described a parade passing by. Although the other man could not hear the band – he could see it in his mind’s eye as the gentleman by the window portrayed it with descriptive words. Days, weeks and months passed. One morning, the day nurse arrived to bring water for their baths only to find the lifeless body of the man by the window, who had died peacefully in his sleep. She was saddened and called the hospital attendants to take the body away. As soon as it seemed appropriate, the other man asked if he could be moved next to the window. The nurse was happy to make the switch, and after making sure he was comfortable, she left him alone. Someone sent me this and I cannot remember who, but thank you! After my last article on Speak Your Mind But Mind Your Speech some readers called “foul” saying I did not also identify people from the liberal side who have also been known to denigrate those they do not like with discriminatory comments. Please let it be known that I find any racist, sexist or any kind of prejudicial comment to be abhorrent. All of it, regardless of the political agenda, is divisive and hurts us all as a people and as a nation. I started looking into it and found this article which also addresses the issue from both “sides”. Check it out. We need to be able to speak our minds, share our views and most especially listen without personally attacking each other, calling out names, and hurling obscenities and hurtful hateful comments at one another. We ALL need to grow up, be responsible adults and show respect for opposing views. Taking issue with an issue is one thing and can be fodder for a healthy exchange of ideas. Personally attacking the speaker for having a differing view is a game stopper. Please note that in my article on Rush Limbaugh, I did not attack the man personally. Although I find his despicable comments to be among the most divisive in the public domain, I did not denigrate him personally nor the political agenda that was behind his misogynist comments, but I did take issue with his behavior and prejudice. It wasn’t OK with me then, it’s not OK with me now and it will never will be OK with me to do so, no matter who does it..
MONTGOMERY, Ala., March 14, 2012 — /PRNewswire-USNewswire/ — The Alabama Federation of Republican Women will hold a news conference to publicly call on the Alabama Democratic Party to cancel their upcoming fundraiser with offensive TV personality Bill Maher on Thursday, March 15, at 10:00 a.m. in front of the State House. Thank you to Deb K. for sending this information to me. Over 50 companies and organizations pulled their advertisements from Rush Limbaugh’s radio program. A total of 86 ads aired during WABC’s online streaming broadcast of The Rush Limbaugh Show a few days ago. But why give any attention to a buffoon like him? Why even respond to his rantings? Doesn’t that just give him more attention? Perhaps we should just ignore him. Limbaugh has significant media exposure and this alone makes him a person of influence. Because of his access to a wide audience (he has the largest following of any commercial program on radio) his ignorant prejudice and his racist, and sexist comments take on a power and a perceived reality for some people that is not the truth. This in turn feeds a society at large and a culture is formed and/or reinforced. This is how we create “reality” . . . by believing perceptions are true. Once a group of people think a perception is true then you have an even larger force to deal with. The group now starts to gather evidence of how their opinions are true and they also gather around them others who think more or less like they do, and soon a new “reality” is formed. It’s not THE reality, but it is their reality. Perceptions that ignore all the facts are particularly dangerous within a society. We need not look very far to see how people of power and influence have helped shape the minds and actions of large masses of followers in a way that deprives others of their dignity, freedom and even their lives. Perceptions that are damaging and destructive to other human beings need to be addressed in a way they can be heard. Letting them slip by without notice or confrontation allows for a destructive, unconscious framework of thinking to be formed, gather momentum and become realized. However angry reactions can feed the flames so don’t fight the thinking. That kind of resistance indeed gives power to the prejudice. Simply seek a way to influence it. If it is a racist joke, a sexist comment or any action that depicts prejudice, the best way to respond is to not tell the person how wrong they are because no one listens to that feedback very well. Simply speak up and tell them how it affects you. Writing to Limbaugh’s advertisers is an excellent way of telling him how his comments affect you. Now the choice is in his hands. He can keep talking like that or not but he is aware that his words do not “rule the roost” and that there are consequences for his actions. Why? Because you let him know. Everyone has a right to free speech and I will defend Limbaugh’s right to speak his beliefs regardless of how abhorrent they may be. But when he, and others who think like him, don’t mind their speech and seek to diminish and denigrate others, then I, too, will exercise my right to speak up because that’s not OK with me.